The post loads with the title, sidebar/content and link, etc, but the slider/video/image is missing or blank. Portfolio and Album posts look for attachments on the post in order to build a set of images to display in this post’s special template. If you created a portfolio, album or gallery post and selected images from your media library rather than uploading them, they do not actually get attached to the post and so cannot be found by WordPress when it builds the page. This only works if you insert the images into the post, which defeats the purpose the post’s template is trying to achieve. Click Add Media at the top and upload the images you want displayed in this post’s gallery or slider. Click Featured Image on the left and choose one to use as the featured image then click Set Featured Image button on the bottom right to close the Media Library. Choose any available options for the post in the posts Options panel, select a Category, then Publish. This will show you any images that are attached to this post. If it returns nothing, your post has no attachments. Click Select Files to upload the images for this post. This will attach them to the post and create your slider/image set. If you do not want to re-upload the images, you can manually attach existing images to posts using the following method. 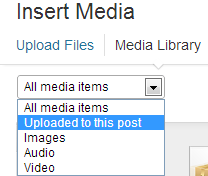 Click on Media and ensure the list view is enabled by clicking the first icon in the toolbar below the Media Library heading. Locate the images that belong to the problem post and see if they are attached to a different post, or unattached. Repeat for each orphaned image. Once complete, reload your posts and the images should now appear as expected.